At The A/C Guy, we focus on things that we feel are important to you when you need an air conditioning and heating company. Like keeping service appointments that fit your busy schedule instead of ours. A respect for you, your home and your property. Repairing things right the first time. At The A/C Guy, you get on-time service, up front pricing, and a job done right the first time—guaranteed. We’re so confident you’ll be pleased with our prompt, friendly, and professional service, you’ll become a customer for life. 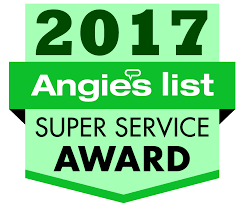 The A/C Guy, LLC has earned the service industry-coveted 2017 Angie’s List Super Service Award, an honor awarded annually to approximately 5 percent of all the companies rated on Angie’s List, the nation’s leading provider of consumer reviews on local service companies. Copyright © 2018 The A/C Guy, LLC, all rights reserved.